John Elliott (Bunk) Herrod was born December 15, 1956 and passed from this life on March 28, 2019 at this home in Ada, Oklahoma. John served in the Oklahoma Army National Guards Co.C (-) 1BN 180th Infantry Brigade and discharged on April 10, 1998. He worked for Chickasaw Nation for 3 years until retirement due to his health. John is preceded in death by his parents, Robert and Louise (McCosar) Herrod. Spouse, Susan Thomas; sisters, Elouise Harjo, Katie (Kincaid) Herrod and Gladysteen Herrod, brothers; Richard Herrod, Jimmy Frank Harjo, Lewis Wayne Harjo and niece Roberta Edwards and Larry Mahee. 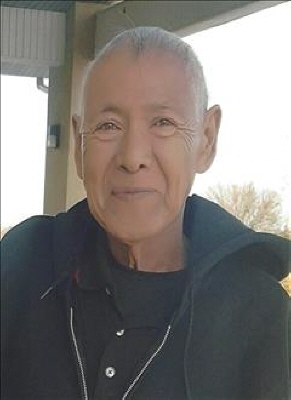 He is survived by his brother, Amos Harjo Jr. (Michelle) of Cyril, Oklahoma, sisters; Zula Herrod of Calvin, Minnie Herrod of Wetumka, Frances Herrod of Ada, Leona Herrod of Calvin and Estelle Herrod of Calvin, daughter Nikeeya Herrod of Wewoka, son Emerson Davis, step-sons; John Thomas (Tanna) and Justin Thomas of Ada, Companion Tonya Miller, seven grandkids, two great-grandkids, twenty-seven nieces and nephews, forty great nieces and nephews, twenty-one great-great nieces and nephews and many other relatives and friends. Wake service 5:00-7:00 PM Sunday March 31, 2019 at Hudson-Phillips Funeral Home. John will be taken to the Tookparfka Baptist Church in Calvin on Monday April 1, 2019 at 4:00 PM. Wake will begin at 8:00 PM. Funeral service will be 1:30 PM Tuesday April 2, 2019 with burial at the Herrod Family Cemetery. Pallbearers are nephews; Anthony Fish, Mitchell Harjo, Joshua Harrison, Eric Harjo, Robert Harrison, Murphy Herrod. Honorary pallbearers are Ray Gomez, Jimmy Jones, Eric Coley, Mikell Harbin, Charlie Miller and Brian Harjo. Rev George Harjochee will be officiating and obituary will be read by Eddie Gooden. To send flowers or a remembrance gift to the family of John Herrod, please visit our Tribute Store. "Email Address" would like to share the life celebration of John Herrod. Click on the "link" to go to share a favorite memory or leave a condolence message for the family.